Your Care Wishes. Shared in Real-Time. MADiE ensures your wishes are known and honored when you are unable to speak for yourself. 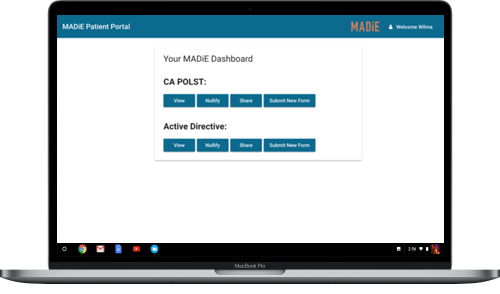 My Advance Directive Information Exchange (MADiE) is a cloud-based, patient portal for ACP documents, including POLST, Advance Directives, Power of Attorney, Living Will, and DNR orders of various formats (e.g., EMS DNRs, POST, and MOLST). MADiE helps ensure that patients’ wishes and preferences regarding their care at the end-of-life are known and respected by care provider’s, even when they are no longer able to discuss their wishes or make decisions. Interested in learning more about MADiE?